Picture a luxurious bathroom the size of living room, with luxurious fixtures, and a magnificent view from the bath to the ocean beyond. Welcome to the world of luxury cruise ship suites. Or more specifically, their bathrooms. 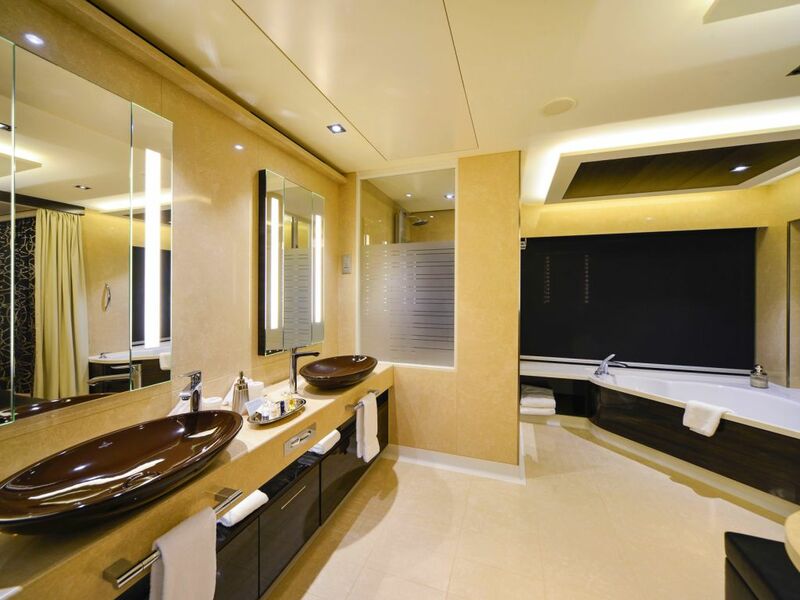 You will find the plushest bathrooms in the best suites on mega ships, and in many of the suites on the smaller, five-star vessels. These luxurious sanctuaries boast the highest quality toiletries, the finest décor, and often, outstanding sea views from the comfort of a large bathtub. What makes a luxury bathroom? I think there are several factors. An excellent bathroom is expansive, a therapeutic destination to spend some quality time relaxing, and an exciting space you cannot wait to return. 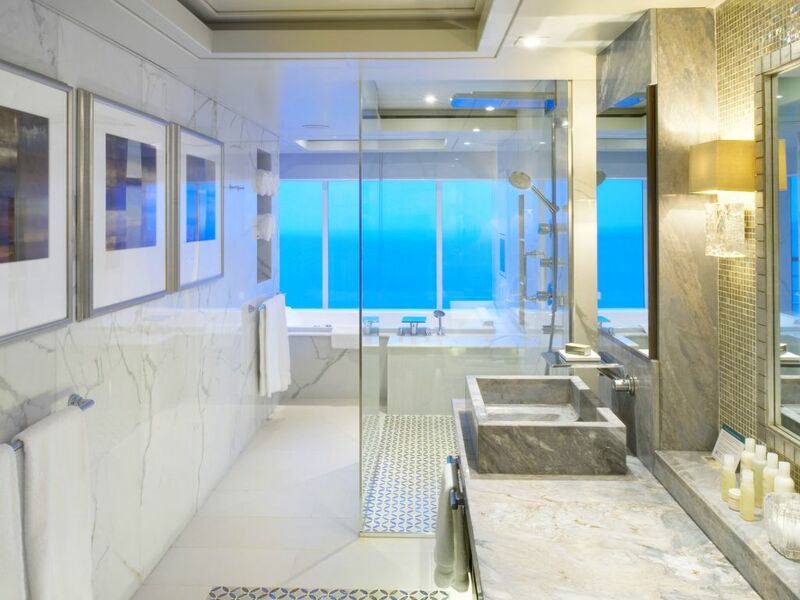 These are the finest bathrooms you will find at sea. Part thrill, part luxury, this bathroom features a cantilevered shower cubicle that extends over the sea below. The Reflection Suite on Celebrity Reflection benefits from a corner plot and boasts floor-to-ceiling windows, making it feel light and spacious. The bathroom comes with a telescope (naturally) along with his-and-hers sinks, a whirlpool bathtub, and a spacious cantilevered shower cubicle complete with a rainfall effect shower head. Don't panic - the rest of the ship will not see your naked body as you shower, as the full-height glass windows are mirrored on the outer side so you can see out, but the world cannot peek inside. 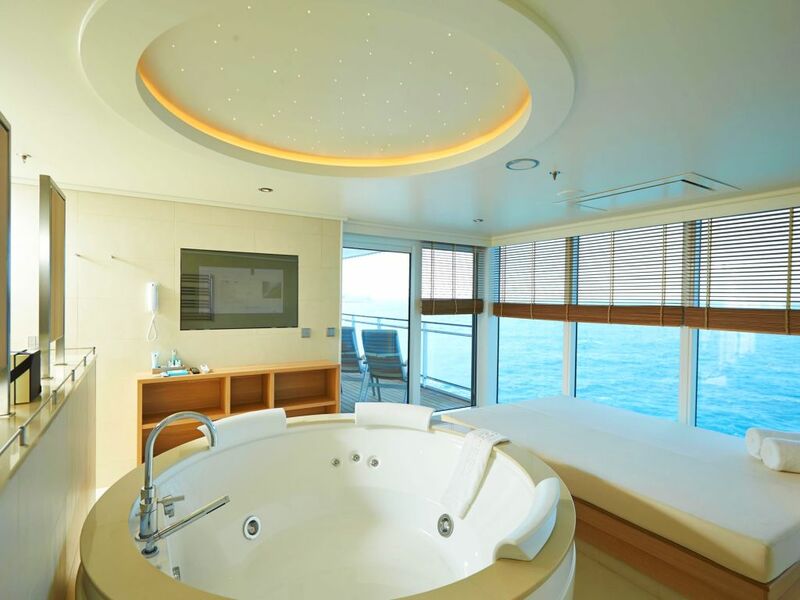 This suite is available on several Norwegian Cruise Line vessels and is part of the Haven collection. Haven suites come with access to an exclusive members-only area offering serenity in a more private space. The Penthouse Suite is large, and its bathroom is no different. It offers his-and-hers sinks together with a large angled bath and separate shower cubicle. A cut-down bathroom of the Penthouse Suite but no less beautiful, the Familly Villa suite is a good alternative. It too comes with access to The Haven and features his-and-hers sinks together with a bath and separate shower cubicle as well as those all-important views but in a more compact setting. I prefer the colour scheme used in this cabin versus the Penthouse Suite. Both Crystal Symphony and Crystal Serenity boast an entire deck devoted to Penthouse Suites in a range of sizes, with two Crystal Penthouse Suites available on Crystal Symphony and four on Crystal Serenity. These suites are the crème-de-la-crème of the luxury cruising experience. 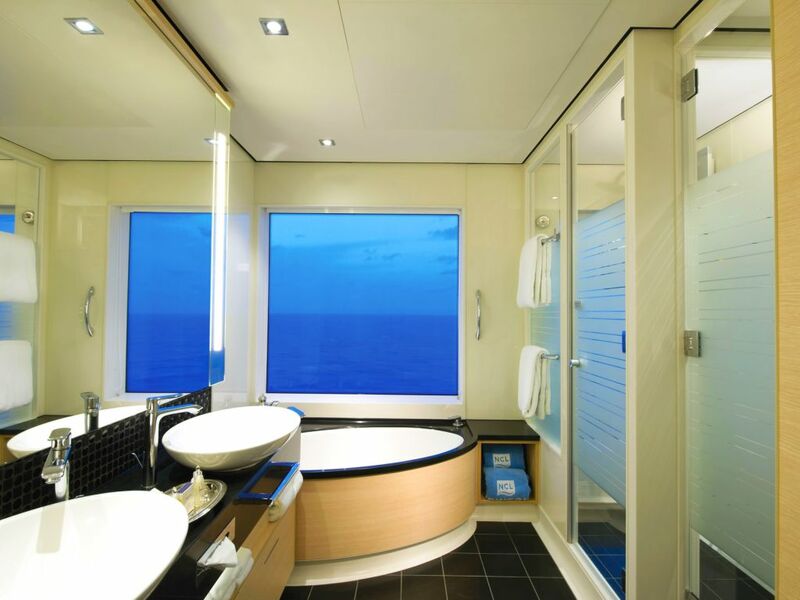 While Crystal Symphony offers more floor space, I think Crystal Serenity offers the better-looking bathroom, with panoramic windows rather than a large porthole. The bathroom suite boasts a Jacuzzi bathtub and a separate glass-panelled shower cubicle. The finish is beautiful with Calcatta marble floors together with crystal sconces and a modern and stylish design. Voted as the most luxurious cruise ship in the Berlitz Guide to Cruise Ships 2015, Europa 2 offers excellence and luxury to exceptionally high German standards. Each suite ticks the boxes of comfort and style. For the very best, the Owner's Suite is unsurpassed. The suite is massive, and the bathroom is out of this world. More akin to a spa treatment room than a bathroom, it is sophisticated and luxurious yet very practical. The centrepiece is a giant whirlpool bathtub positioned to overlook the ocean through the floor-to-ceiling windows. There is a separate shower with steam sauna and his-and-hers sinks too. The bathroom even has a daybed and television too - the ship architects foresaw you would not want to leave this room once you had seen it! 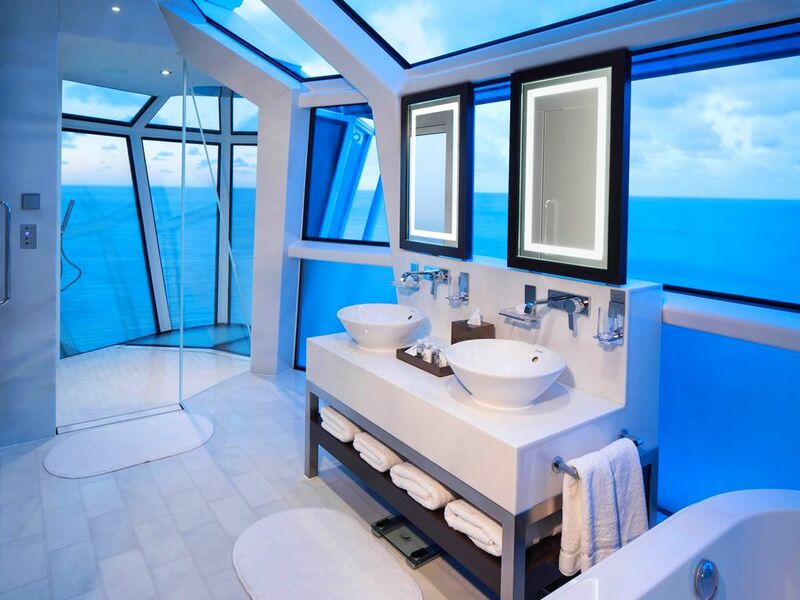 If you had a bathroom like this, with unending ocean views and luxurious decor, could you tear yourself away to visit other parts of the ship? Leave a comment below.